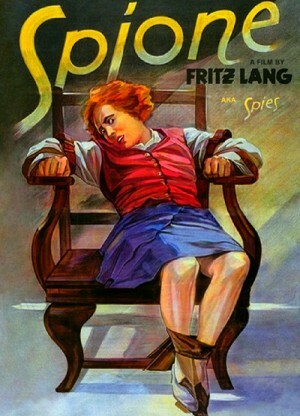 Spione is a spy thriller (if the English title didn't make that obvious) with a labyrinthine plot. Basically a spy ring headed by the evil Haghi (Rudolf Klein-Rogge) is causing chaos at the government's secret service. Important documents have been stolen, dignitaries have been assassinated and double agents are springing up all over the place. Next on Haghi's list of crimes is to get his hands on a peace treaty to be signed between Japan and the UK, in the hope that he can use it to trigger another world war. The only man that can stop him is agent 326 (Willy Fritsch). Haghi is always one step ahead though and sends the cunning Russian spy Sonya (Gerda Maurus) to seduce him and lead him down a dark path. A spanner is put in the works however when Sonya and 326 fall in love. If you think this all sounds a bit like a James Bond movie you wouldn't be too far from the truth. Although less obviously groundbreaking as some of Lang's more famous titles, Spione is clearly a huge influence on the spy thriller subgenre. • Documentary - this excellent documentary film takes a closer look at the production history of Spione as well as the socio-political climate in Germany at the time when it was produced, some of the key differences between the German and English versions of the film, and the evolution of Fritz Lang's directing style. Included in it are interviews with writer/director Guido Altendorf and writer/director Anke Wilkening. The documentary was produced by the Friedrich-Wilhelm-Murnau-Stiftung in Wiesbaden. In German, with optional English subtitles. (72 min).